Is There an Android Application? As a newer bookmaker with a focus on the U.K and international market, BuffBet operates on the belief that all are equal and therefore have chosen not to provide a dedicated Android application. They have, however, as so many other bookmakers of today do, a fully functioning mobile version of their site. That allows them to direct their energies towards implementing the best possible experience to their members versus the massive investment towards mobile app development. 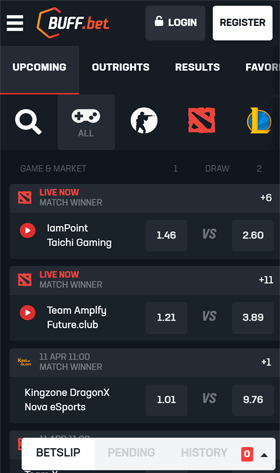 As such, its purpose is to give a unique version that is identical to its browser-based desktop that includes an identical selection of betting markets. Those include eSports, a live casino, virtual sports, live casino and a highly praised sportsbook. Current account holders need only to open a mobile browser, visit Buff.bet and enter existing log in details, and those new need only register to begin enjoying all Buff.bet’s features. Are there iOS .app for download? Those wishing for a dedicated iOS app will also find an app not offered. As with its Android mobile members, Buff.bet has chosen to provide access through its browser-based mobile site, equal it every aspect to its desktop site. As a result, iOS mobile users met with equal quality access to all its betting markets from sports to its online casino, live casino, eSports and virtual sports. The overall result is a convenient mobile version that is capable of meeting the needs, both in software, banking and support services to all its users. Existing members can log in with their current details, while those interested in becoming newly registered users need the only signup by clicking the “register” button. The mobile version of Buff.bet is identically designed to ensure a smooth, reliable and quality driven experience that is, in many ways, superior to a mobile app. The incorporation of the same selection of colour schemes creates a feeling of familiarity. That familiarity extended to its layout with the only notable difference being categories are listed in a drop-down menu versus at the top of the site. Its graphical quality is unsurpassed with explicit, concise imagery highlighting its various promotional offerings and affords the same navigational luxuries as its desktop counterpart. All betting markets included within the mobile version, and for existing players, who have come to expect a fully functional brand, they will be pleased by the results. That extends to all its features irrespective of the betting markets but also the support and banking options, security features and software providers powering its gaming selections. Buff.bet put a strong emphasis on the development of an innovative mobile version and within, included an equally impressive selection of innovative features that are designed to increase the betting experience derived by punters. That is especially valuable for “on the go” participation as it increases flexibility when placing bets. In our quest to provide a detailed evaluation of the features offers, we have chosen to highlight three of the more appreciated betting features; in this case, a cash-out option, in-play and a live streaming option. The early cash-out option is a highly prised affair for active punters, especially while coordinating it with in-play betting activities. It is one that provides greater control over bets as it affords the luxury of selecting early cash out on those sports events that appear not be ending favourably. Electing to exercise this option allows punters the ability to manage loss; however, it will result in the forfeiture of an amount equal to 50% of the staked bet. It is one often associated with larger sportsbooks, but, unfortunately, this valuable commodity is not available at Buff.bet. In-Play is another of the highly useful options provided to bettors at Buff.bet. While common amongst sportsbooks, it is one worth highlighting as it retains substantial benefits and allows you to bet on a generous variety of sports markets while matches are active. A sampling of the available in play sports offered includes Baseball, Soccer, MMA, American Football and Cricket. As an added advantage, the in-play section allows for the monitoring of scores in real-time, access to updated odds and the inclusion of multiple betting options relevant to each sport. Further enhancing their forward-thinking capabilities and features, Buff.bet’s live streaming option gives the ability to place bets in real-time using your mobile device. That is available for eSports, and as a measure of convenience, those sports with live matches are highlighted to provide easy manoeuvrability to sports of interest. Additionally, all scores and odds are updated in real-time to ensure a superior betting experience achieved. The availability of betting options often is the definition that determines a bookmaker’s success. Resultant to that, Buff.bet exercised its strategic right to ensure it meets the growing needs of its members. The range encompasses most popular trends such as a mobile sportsbook, casino and live casino, and in continuing on the principle of meeting expectations, is browser compatible for most tablets and smartphones. This includes Google Chrome, Safari, Firefox and Mozilla to name a few. The mobile site is impressively designed to be accessible to ensure a full range of available sports. While the expectation that those sports most popular will be available, it is essential to mention that the variety of options, in particular, the type of games and bets offered, afford punters flexibility. That ultimately improves the experience, and adding to that is a variety of navigational tools to allow fluid movement throughout the site via one-click features and search bars. The Buff.bet mobile sportsbook offers a reduced number of sports betting markets than some larger bookmakers but checks the boxes with Soccer, Baseball, MMA, Tennis, Rugby and Ice hockey. Bettors will also appreciate that the sports betting section features lesser known sports such as Water Polo and Golf. However, it extends its reach to include a rather impressive selection of eSports. When you look at the eSport choices, a feature not so familiar with sportsbooks, it is not difficult to realise the value and why it is growing in popularity. Those wishing for a break from Sports betting will be pleased by the comprehensive selection of online casino games available at Buff.bet. The selection is quite captivating an impressive with video poker, slots, lottery and card games. Punters electing to participate in its vast game library will be met with a bonus of 100% up to €88 and can furthermore enjoy unique gaming categories such as Casual games, and War, but also timeless classics such as Roulette, Blackjack and Baccarat. Powered by innovative game suppliers Microgaming, iSoftbet, BetSoft, Pragmatic Play, Elk Studios and others, it includes multiple features designed to make navigating its vast game section a painless experience. Buff.bet has chosen to include, for its mobile members, a collection of live dealer casino games to those punters wishing to place live casino bets. The choices extend to those most popular, and that is instantly noticeable with Casino Hold’em, Blackjack, Baccarat and Roulette. Powered by Ezugi Gaming, it also includes unique games such as Keno and Bet on Numbers. Mobile punters will find player-friendly features unique to Buff.bet that allow for the collection of favourite, recently played, favourites and the ability to view player history. While the selection may be limited, it encompasses multiple variations to ensure a variety that is simple, yet pleasing. The Buff.bet mobile version heralds in the similar characteristics that many mobile sportsbooks versions do today, that being the sharing of same colour schemes and navigational features. That similarity to its desktop site providers a level of comfortability for punters allowing them to locate areas of interests when placing bets quickly. While slightly different in its overall layout due to mobile screen viewing limitations, it is betting features, and available betting markets remain intact. That affords a simple user-interface that makes navigating quick and easy. It allows for simply betting at the casino, live casino or sports as it does logging in or registering. It most notable drawback is its lack of live support, and for that matter, the ability to locate the support quickly. Buff.bet, in its pursuit to make all mobile punters feel welcome, has gone to extensive efforts to ensure a design that is accessible via most, if not all, mobile browsers. Its functionality on most devices is flawless, and problems relating to the viewing of its betting markets should not be a worry. However, while every effort is taken to ensure equal access, some older devices that do not have the latest operating systems could experience some quality issues. To combat that, if using an older model, consider updating to the newest operating system, in the case of Android, 4.1 is recommended, and for iOS, 5.0 or later. In our endeavour to save you time, we have compiled a small list of those mobile manufactures where compatibility will not be an issue. Mobile exclusive promotions are not a featured part of betting at Buff.bet’s mobile version. That is intentional to ensure all have an equal participation opportunity when claiming any of the promotion and applies to new and existing players. As a result, all bonuses released via its desktop version are available via its mobile. Just select your offers of choice, follow the prompts for claiming and proceed with your deposit. The selection of realisable and trusted payment methods is an integral part of a trusted bookmaker’s foundation for success. Far too often sportsbooks will limit the number of methods limiting punters options. Buff.bet, aiming to provide mobile-friendly opportunities, have succeeded in partnering with proven and trusted payment providers such as credit cards and web-wallet to allow the secure transacting of deposits and withdrawals. Below, a list of the available deposit methods has been conveniently compiled to include the payment method, deposit/withdrawal minimums and maximums as well as processing times. Is there an F.A.Q section offered at Buff.bet? No, unfortunately at this time, Buff.bet does not offer an F.A.Q section. Instead, punters in need of questioned answered can email support at support@buff88.com with their questions, and a support representative will respond accordingly. Am I able to directly contact support via the mobile site version? No. All communication, at this time, with Buff.bet’s support centre, is carried out via email. The support centre is available 24 hours a day and will respond within an appropriate time based on support volumes. Am I able to control settings for my account via the BuffBet mobile site? Yes, actually quite a few. That includes your betting slip, odds, language and viewing preferences and time zones — additional settings offered within the cashier section that allows for banking preferences to be set. Do I have the ability to register a new account through the mobile site, or must I use the desktop site? Absolutely. Registering a new account is offered with both the desktop and mobile site. Just click the “register” button located in the upper right of the site, and you will redirect to the registration page. That will require select information provided. Once completed, you will have full access to your account where you can transact deposits and place bets. Does Buff.bet offer live streaming through its mobile site? No. At this time, neither the mobile nor the desktop site offers live streaming of sports events. They do, however, provide live betting via in-play betting options. That found under the “live” tab located at the top of the BuffBet site. The live streaming option is available only for eSports. Are all betting platforms accessible via the mobile version of Buff.bet? Absolutely. As the mobile site is necessarily the same as its desktop site, all betting platforms are offered, and subsequently available to mobile punters. That includes the live casino, online casino, virtual sports, sportsbook and eSports. What security measures does Buff.bet have in place to protect my personal and financial information? Quite a few. Buff.bet, as a licensed sportsbook, must adhere to strict guidelines that relate to the securing of player information and all transactions carried out via its cashier section. That included encryption technology software, multiple firewalls as well as deposited funds stored in separate bank accounts. Buff.bet, a company based in the British Virgin Islands, is located at Intershore Chambers, Road Town, Tortola. It is wholly own by Galaxy Group Ltd and operates under a licensed issued by the Government of Curacao. It, therefore, is regulated under its licensing agreement that provides it permission to operate and accept bets. That includes eSports, virtual sports, a sportsbook, online casino and live casino. Those wishing to contact Buff.bet may do so via telephone (+44 20-3286-7751), or by email at support@buff88.com. The more critical appealing factor to Buff.bet’s mobile version is its simplicity, but also its user-friendliness, both admirable qualities many punters look. The design is meant to allow for flexible betting and one that is efficient and easily accessible, regardless of your location. The added betting features amplify the focus towards punter choices and having access to a full range of betting markets is always ideal. The layout and overall functionality are smooth. However, welcome bonuses and the lack therein of many secondary promotions is an area that may see as a deterrent. The same applies to its support centre and lack of available contact methods. Based on that, and considering the completion in the sportsbook market, we give Buff.bet an overall rating of 6 out of 10.